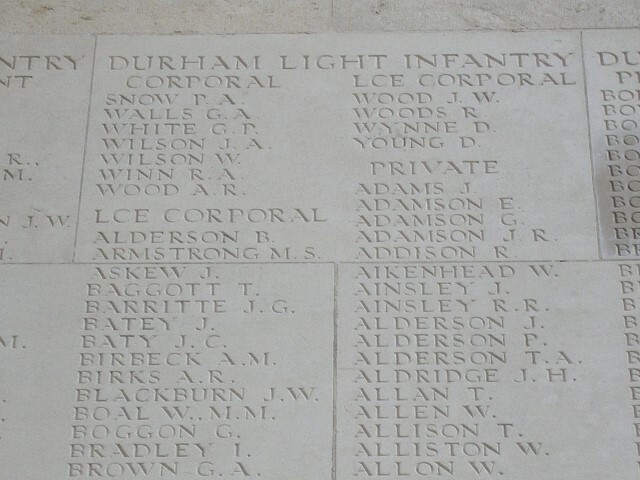 17453 Lance Corporal Maurice Sewell Armstrong, 15th Battalion, the Durham Light Infantry, was killed in action 1 July 1916 and is commemorated on the Thiepval Memorial to the Missing of the Somme. He was 21 years old and is commemorated on the Butterknowle War Memorial and the memorial plaque in St. John the Evangelist Church, Lynesack. He was known as Morris Sewell and is commemorated under this name on both Butterknowle memorials but Army and CWGC record him as Maurice Sewell Armstrong. Maurice Sewell Armstrong attested 8 September 1914. He was 19 years 11 months at the time and described as 5ft. 5ins. tall, fresh complexion, blue eyes and light brown hair. He worked as a miner. Private M.S. Armstrong survived. He was promoted to Lance Corporal 8 January 1916. 1 July 03.00am: 15/DLI was ready to advance behind the 9/KOYLI, who led upon the right. Day broke beautifully fine, and the German reply to our terrific gunfire was of no great strength. At twenty-five minutes past seven the heavy artillery lifted from the German front line, and the eager Yorkshiremen began to climb out of their trenches and advance into the smoke as the shrapnel barrage came down. 15/DLI followed in their turn, with A and B companies in front. German machine guns-hastily hoisted from deep dug-outs which were little damaged by our hurricane of high explosive-opened on the Durhams, who covered 200 yards of “No Man’s Land” without a pause and entered the shattered German line. Men in field grey came out of the earth and surrendered, but others were fought with bomb or bayonet where they resisted in shell craters and bits of standing trench. So 15/DLI won their way until they joined the Yorkshiremen in the sunken road and what had been Round Wood upon the left. More prisoners were gathered in the dug-outs under the bank, but 15/DLI went on over the open and before 08.30 had taken Crucifix Trench, which ran out beyond. The shrapnel barrage moved ahead, but the ground in front was swept by machine-gun fire from the right, where the Germans still held Fricourt, and from the left, where they lay in Birch Tree Wood. 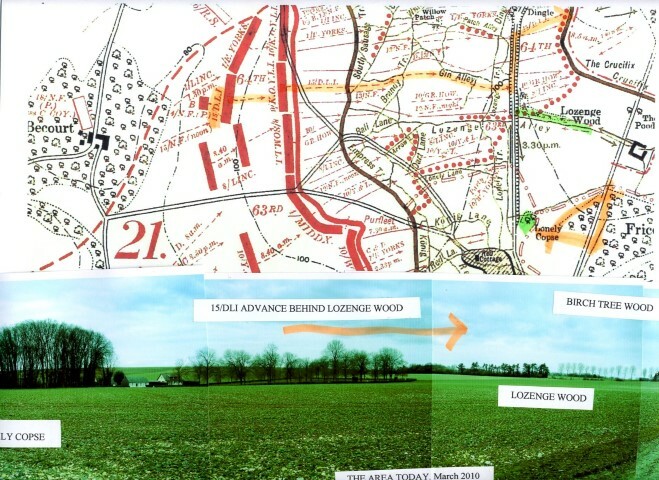 At 13.40 came orders to try for Shelter Wood, even if the advance were carried no further: but the protective barrage had come down ten minutes before, so that the venture had to be made without artillery support. Fighting patrols went forward to gain what ground they could and in this advance Capt. D.H.J. Ely, already wounded in the foot, was killed by a German sniper. Pte. J. Jolley spied the slayer as he prepared for a second shot and British and German fired together. A bullet grazed Jolley’s nose but he got his man through the head. Second Lieutenants F.J. Cartman and A.S. Morley, who had each replaced a fallen company commander, thrust forward with their men until shell holes only 40 yards from the woods were reached. 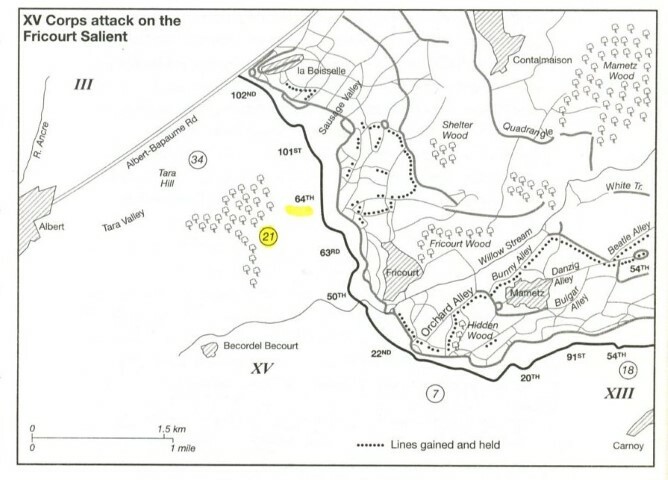 In these positions the Durhams sniped at such of the enemy as could be seen and, despite repeated attempts to dislodge them, held on until relieved eight hours later. Both officers eventually received the Military Cross. As the afternoon wore on the captured area was heavily shelled, while machine-gun bullets whipped along the sunken road. At 17.00 Germans were seen assembling near Birch Tree Wood, and a party of 300 advanced but were dispersed with heavy loss by Lewis gun fire. While watching this affair Colonel Fitzgerald received a machine-gun bullet in the thigh and was carried to his headquarters. Fourteen hours passed before he could be conveyed to the rear and, though he reached a London hospital, he died 12 July. In the evening two companies of the 10th Yorkshire Regiment arrived in Crucifix Trench to establish touch with the 63rd Brigade upon the right. 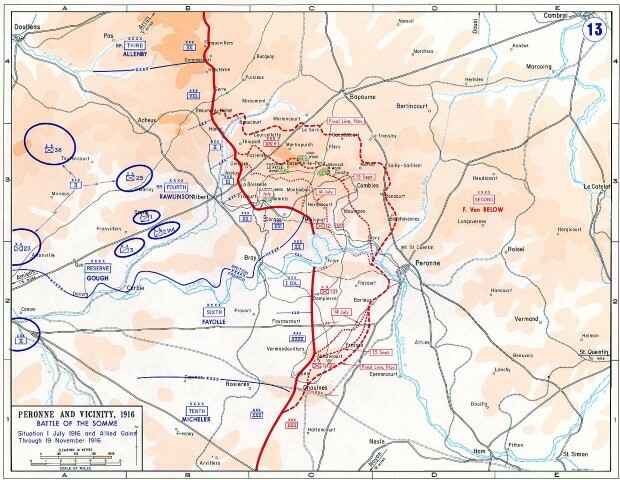 It was much later when the Lincolns and Middlesex appeared to take over the positions held by 15/DLI, a long and difficult operation which was not completed till dawn. 2 July 6.00am: parties were still arriving in the original British front line, where 15/DLI assembled under Major R.B. Johnson. Grievous losses had been suffered. Among the other officers killed were Captains J. East and L.H. 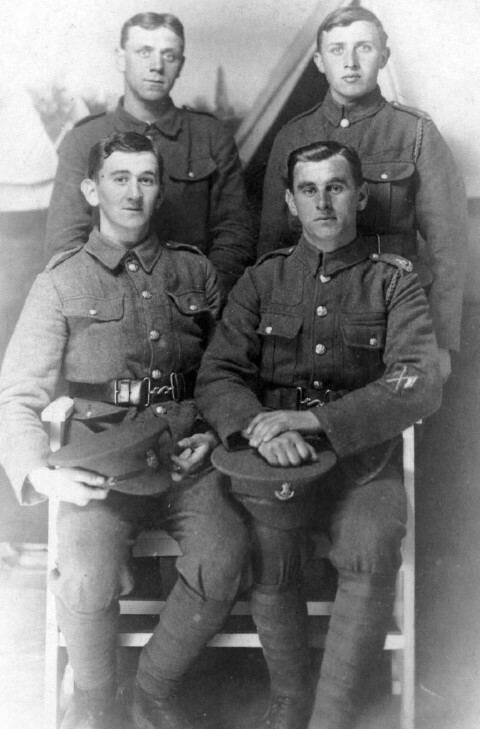 Sanger-Davies, and Second Lieutenants R.O. Cormack, C.S. Haynes, J.M. Jones and M.L. Huddlestone. Captain F.P. Stamper was among the wounded and casualties in the ranks numbered 440. For their gallantry, Sergants E. Willison and T. Jones, Corporals F. Connor and J.B. Lauder and Privates J. Gray, J. Robinson, J.W. Robson, G. Tait and S.S. Dennis were awarded the Military Medal. The captures of the brigade – it is impossible to say what fell to each battalion – were 200 prisoners, one field-gun and numerous machine-guns. Later research records that 6 Officers and 123 Other Ranks serving with the 15/DLI were killed in action or died of their wounds between 1 and 3 July 1916  including 17453 Private M.S. 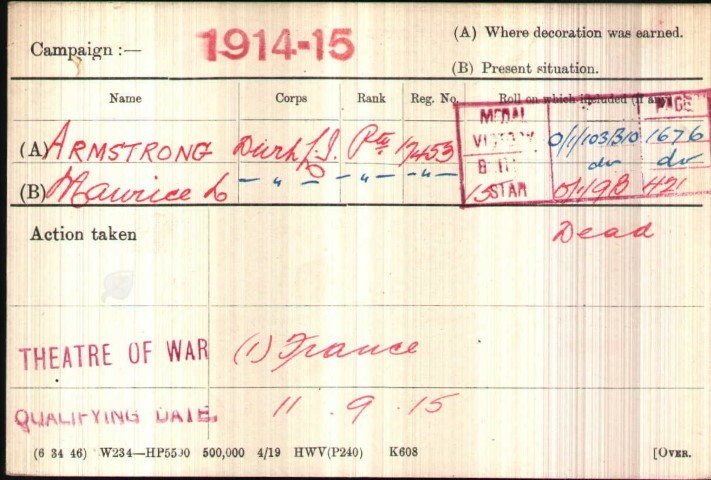 Armstrong who was killed in action in the field 1 July. He has no known grave. He had served a total of 1 year 298 days and was awarded the 1914-15 Star, the British War and Victory medals. The personal effects of Lance Corporal Maurice Sewell Armstrong were forwarded to his father George Sewell in October 1916. He also received the commemorative plaque and scroll in August 1919. “Mr. 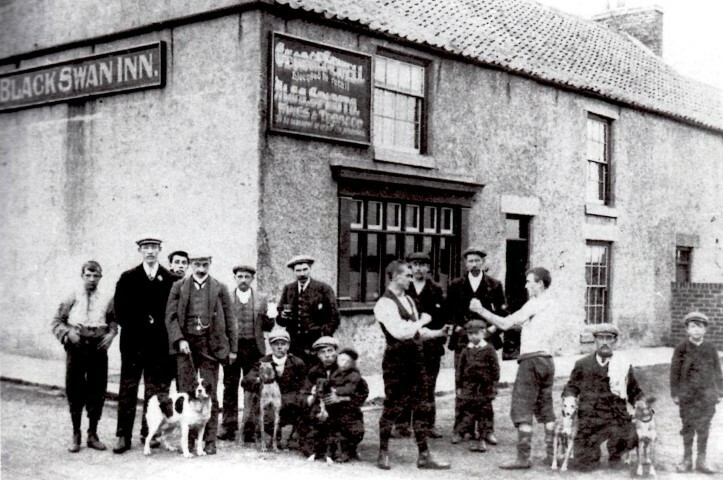 & Mrs. Sewell of the Black Swan Hotel, Wham have been notified by the War Office of the death of their son Maurice who was killed in action on 1st July. The deceased young fellow who was attached to the 15th D.L.I., enlisted at the outbreak of the war. In a letter to his parents which is dated 7th July, Pte. 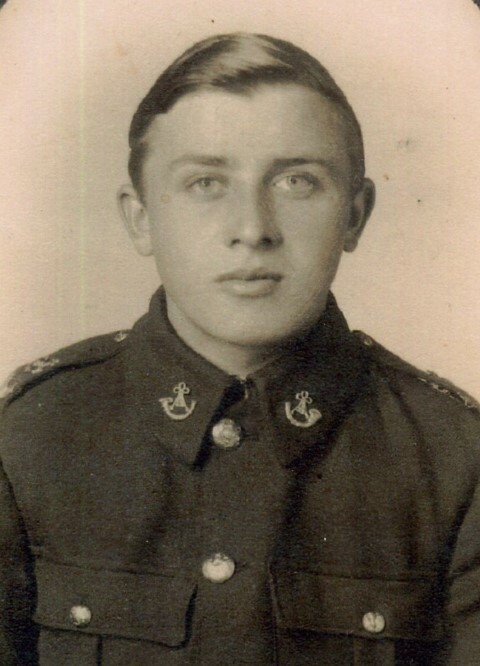 John Craggs, one of the deceased’s pals, regrets to announce the death of Maurice and says he died a hero fighting for his country and that all the men and officers deeply regret to mourn the loss of such a promising young soldier. He was greatly beloved by all his companions as a faithful and generous boy. It is only a short while ago since he was paying a short visit home. 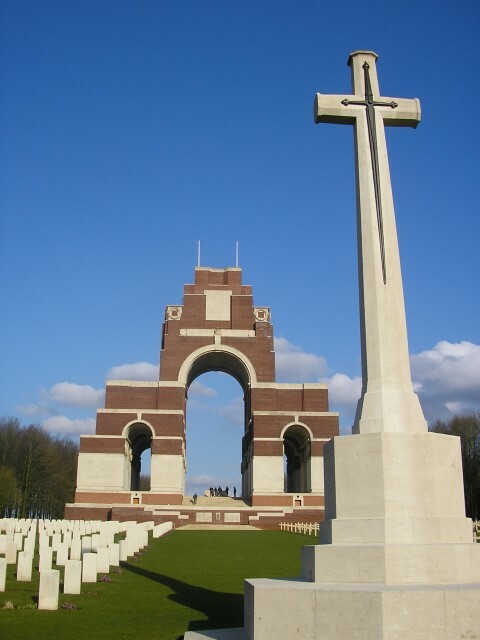 Thiepval Memorial, the Memorial to the Missing of the Somme: Lance Corporal M.S. Armstrong is commemorated here. The Memorial bears the names of more than 72,000 officers and men of the UK and South African forces who died in the Somme sector and who have no known grave. Over 90% of those commemorated died between July and November 1916, the duration of what we now call the Battle of the Somme. The memorial, designed by Sir Edwin Lutyens, was built between 1928 and 1932 and unveiled by the Prince of Wales, in the presence of the President of France, on 31 July 1932. Army Form B.2065 Attestation Papers are clearly in the name of Maurice Sewell Armstrong and his next of kin are George Sewell (father) Mary Jane (mother) Richard Abraham Sewell (brother) Ida Mary Sewell and Lilian Sewell (sisters).